In the United States of America, there are records that 16 children have died as a result of hyperthermia, from the beginning of this year till date. This report is according to KidsandCars. In other words, we have 16 families in the US who will never see their loved ones again. That is 16 children who will never grow up to play in the field, attend and graduate from school, experience heart break or eventually tie the knot with someone that they love. All these is a result of hyperthermia. Hyperthermia can be prevented, but because of nonchalant attitudes from the part of the parent, many child have lost their lives. 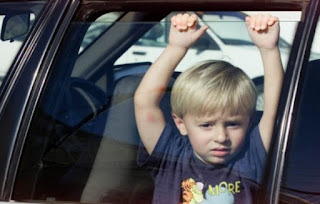 A child should never be left all alone in the car, not even for a minute. This is because a car takes an approximate of 10 minutes to heat up to 20 degrees. Irrespective of the temperature outside or the exterior colour of the car, all vehicles heat up the same way. It is also important for you to know that a child's body temperature heats up 3 to 5 times faster than that of an adult. When the child's core body temperature reaches up to 104oF, they can easily suffer from brain damage and organ failure, and once it gets to 107oF, death will be the final result. Hyperthermia, which is commonly referred to as heatstroke is the most serious for of heat injury. It occurs as a result of prolonged exposure to high temperatures coupled with dehydration. Medically, heatstroke is defined as a core body temperature of 104oF with complications involving the nervous system that develop after prolonged heat exposure. If someone is displaying any of these symptoms, such a person should be given medical attention immediately. Just like I said in my introduction, hyperthermia has resulted to a couple of child death in the United States. It is the leading cause of non-crash, vehicle-related deaths among children of ages 14 and below. However, hyperthermia can be prevented in different ways so as to keep your child safe and alive. Most children are victims of hyperthermia just because their parents or guardians experience a routine which was different from their normal daily routine. For instance, a parent might take his or her child to a doctor's appointment, and because of distractions he or she head straight to work instead of taking the child to a daycare first. Or a grandparent who have never taken a child to school, drove them that day, stopped at the bank to get some cash and forgot the child is sleeping at the back seat. Keep your car locked so children cannot get in without your knowledge. Always learn to check the backseat, even if you don’t have children or animals in the car. Take one shoe off and place it in the back seat as you start your drive. Set an alert on your phone to go off at the end of your drive. Have your daycare center or school call to let you know you never dropped off your child. In all you do, always remember to ACT. A: Avoid heatstroke-related injury and death by never leaving your child alone in a car, not even for a minute. Always lock your doors and trunks – even in your driveway. Also, keep your keys out of the reach of children. C: Create reminders. Place something you'll need at your next stop, like a briefcase or cell phone next to the child safety seat. It might seem simple, but this can be a helpful reminder on a chaotic day. T: Take action. If you see a child alone in a car, call 911. Emergency personnel are trained to respond to these situations. If you find this information important and helpful, don't jus leave without sharing it with your friends and loved ones on various social media. Simply use the share icons below to do so. Thanks!